So many ways to give back at Share! We are built around volunteerism. Help us build healthier, stronger communities by giving your time! If you are looking for somewhere to get involved or to give a little back, Share is the place for you. We believe that every has something to offer to the world around them. Come join us at Share Food Program’s warehouse and Nice Roots Farm, to feel the true reward of giving back to your community. Opportunities at Share are great for workplace teams, families, schools and youth organizations and faith-based groups. Share is a great place for retirees or individuals looking for a way to stay active and involved in their community. The warehouse is a safe environment for everyone to get involved. Please note: all school and youth groups must have one adult chaperone for every five students, and all volunteers under age 18 must be actively supervised by a parent or other adult while volunteering. 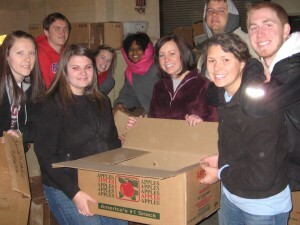 Get involved by volunteering at the Share Center Warehouse. On any given day of the week, Share is a busy hub of activity, with distribution, bagging, boxing, gardening and all sorts of other fun activities occurring. It is a great opportunity to get involved. Groups: If your company, school or religious group is looking for a volunteer opportunity, Share is the place. Whether the goal is team-building or just a passion to give back the warehouse is full of opportunities for groups. To sign-up follow the link below and select the date you would like to volunteer! For those who enjoy giving and are looking to volunteer in a more specialized way, we are always interested. If you have administrative skills from a past career or have some free time on a regular basis that you are looking to fill, please contact to find out how you could contribute. Some of the activities you might be able to help with: order processing, record entries, newsletters, graphic design, web media, and much more. We have many administrative opportunities so please contact Volunteer Opportunities to learn how you could contribute. 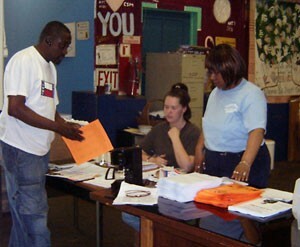 If you cannot make it to our Share Center Warehouse in Philadelphia, you can find way to give back in your area. The Share Host Network is expansive and host sites rely on volunteers to help with their operations. Contact a host site near you to see how you could get involved in your area. If you are looking to take a more active role in our host site network, consider becoming a host site. If one does not exist in your area, you could help bring the Share Food Program to your town. For more information on volunteering please contact Share’s main number at 215-223-2220.